Interview: Doug Gillard of Guided By Voices. GBV Play Jersey City's White Eagle Hall on 4/18. In March, Guided By Voices released Space Gun. The album is the latest effort from the current line-up of Bob Pollard, Kevin March, Mark Shue, Bobby Bare, Jr., and Doug Gillard. It's the only album the band will release in 2018, and it finds them at the top of their game. Space Gun consists of 15 concise gems showing that Pollard, over 2,000 songs in now, hasn't lost a step as a songwriter. The rest of the band bring Pollard's visions to life in a collaboration that is producing songs -- like "Space Gun," "Hudson Rake," and "That's Good" to name a few -- that really can stand with Guided By Voices classics. Guided By Voices are currently on tour for Space Gun, and they'll be coming to Jersey City's White Eagle Hall on April 18th. I got the chance to run a few questions by guitarist Doug Gillard in advance of that appearance. Gillard was a member of Guided By Voices from 1996-2005 and rejoined the band as part of the current line-up in 2016. He is also a member of Nada Surf, a solo artist, a producer, and a contributor on many projects with other artists. He was kind enough to take the time to cover just about all of that and some other very interesting things -- a live album recorded in Asbury Park, what material the band may be breaking out on tour -- in our brief interview. Space Gun came out in March, and it will be the only Guided By Voices album in 2018. Did you all know that going in? Does focusing on just one record change the creative process at all for the band? Yes we had that planned. However, that didn't change our recording or creative process. You and Bob have collaborated pretty consistently, even between your stints with Guided By Voices. Is there the possibility of another, say, ESP Ohio record while we wait for the next thing from Guided By Voices? We haven't discussed it, but I'm sure it's possible there may be another one down the line somewhere. Currently, we all act as consultants to an artist and band Bob discovered named Cash Rivers and The Sinners. We've become drinking buddies with those guys and are all really proud of 'em. I think their new record might come out between GBV albums. Last I heard, our engineer (and ESP Ohio drummer) Travis Harrison was working really hard on mixing some more of their material. They just had a full-length album come out that our home base Rockathon Records just sold out of. And speaking of stop-gaps, GBV just released an amazing live recording of this current lineup called Ogre's Trumpet, recorded late last year in Asbury Park, NJ. 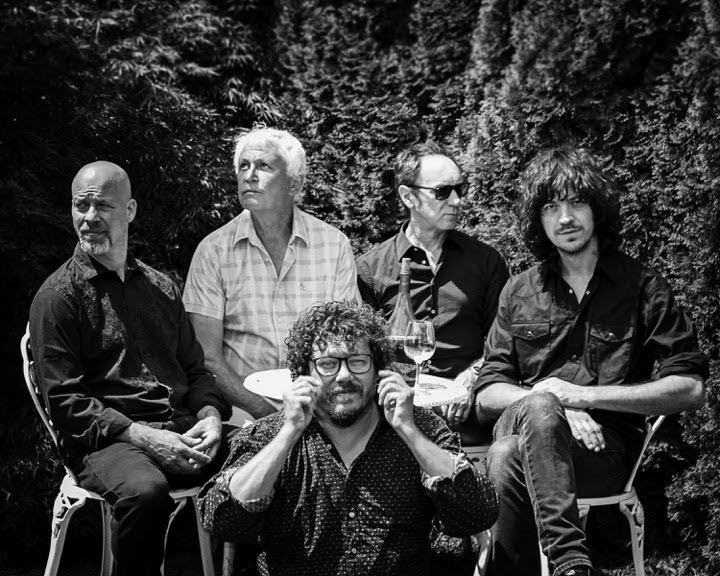 You rejoined Guided By Voices in 2016. What made it the right time to get back together with the band? I was asked to, and it came with an incentive: an all expense paid vacation for 2 to sunny Puerto Vallarta. No, just kidding! I was asked and the time was just right. How does the experience with the current line-up compare with your last stint as part of Guided By Voices? Being on our own label now affords us the luxury of releasing material as often as we see fit. We all seem a little more focused on the material now. Bob is writing more for this band only, as opposed to writing for GBV plus solo and side projects involving otters. Ok, that was a typo; but it looks good so I'll leave it. I meant "others." Now we are the others. Bob is giving this band material he used to reserve for solo or side projects in the past. There's more material intended for the band and more singles released now, so it's always moving. Guided By Voices songs are great for being both catchy and hook-filled while also bringing some interesting sounds to that formula. I hear a lot of that on the new record, like the sounds that open the album, the guitar sounds throughout ("See My Field," "Hudson Rake"), and the string arrangements on "That's Good." At what point in the process do those things come in? Does Bob usually have a fully-formed vision for songs? A lot of it is us adding things in the studio thinking it will work. In "Hudson Rake," Mark added the low piano notes evoking The Trogg's "Cousin Jane." Travis did a classic GBV amp-drop, and the other traily sounds are guitar pedals I used. There's so much material to draw from for a Guided By Voices live show, including nearly 50 songs on the last two albums alone, how do you balance new material and fan favorites in a setlist? Bob comes up with a master set list well before the start of each tour, and we'll lose some recently released songs in lieu of brand new album songs. He's great at sequencing newer vs. older material, and never loses sight of the older fan favorites, reprising some unexpected things in the process. For example, this tour sees us strumming a couple toe-tappers from Earthquake Glue that we know fans love. Bob Pollard is famous for being prolific, but you stay pretty busy yourself between GBV, Nada Surf, and your solo material. Also, I have to mention that you produced The Drop Beneath by Eternal Summers a few years ago, which is one I really loved. First, is it important to you to have a variety of creative outlets like that? Second, do you have anything non-GBV-related coming up in the near future? Thanks. You just mentioned Eternal Summers, so I'll mention that I played guitar on a few songs on (Eternal Summers') Nicole Yun's upcoming solo album, not due out for several months yet. My nephew Chris Steris's band, Bummers (Columbus OH), has a new record in the works, and I played slide on a track. My Death of Samantha mates John Petkovic (Cobra Verde) and Dave James have a super catchy electronic-based project called Metrolite I contributed some guitar to. That will be out later this year. I'm part of a brand new album called Hinge by Cleveland-based avant-garage project Scarcity Of Tanks, and played guitar on several tracks on the upcoming Neko Case album called Hell On. Yes, I'm always writing and working on getting another solo album together. Hopefully, that will happen next year. Most of my solo catalog can be found on my Bandcamp page. Guided By Voices play White Eagle Hall in Jersey City on Wednesday, April 18th. Space Gun and Ogre's Trumpet are out now on the band's own Rockathon Records.